This is an old railroad bridge that takes us to the island where we ride the timber along the Des Moines River. The first few times I crossed this bridge I lead my mule across. Now I just get a little nervous as I am a freak about bridges and heights. 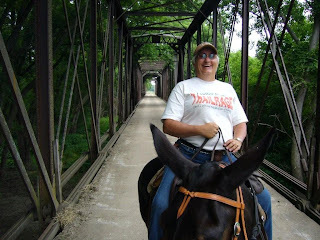 It's about a 30 foot drop at the deepest part but believe me those mules stay right in the middle of the bridge. When we got to the other side someone had dumped out a kitten and it was crying and screaming and the mules wanted to get as far away as they could. Jeanie and I both felt very sorry for that kitten but trying to find it would have been impossible. Maybe I'll get some more pictures of this ride. We rode in an entire field of black eyed Susan's that Jeanie and her husband planted last year. It was like a sea of yellow. Look for more pics later. Even though you are smiling, you're looking a little nervous in this photo. The mule looks relaxed, ears are flopping. (Reminds me of a bridge-mule story. Maybe I'll talk about it on my blog one day). Good photo, hope to see more. Oh you are SO lucky to have a friend to ride with. I vote that you and MJ and I get together and ride ASAP...I think we'd have a ton of fun! And of course everyone would be SO jealous of our mules!!! Yes I'm sure they would. I have been so blessed this year to have Jeanie to ride with. I have rode my mule a few times this year but it's been a weird year weather wise and not may places are open to ride/camp at. We have pretty good riding around here but the river has been out several times in the last few weeks. Need my husband to go first and if he disappears into a hole I won't go that way. HAHAHAHAHAHA!!!!!!!!! Yes MJ I was nervous. Long way to the ground off that bridge. It's not the fall that hurts - it's the sudden stop at the bottom! !